With the holidays over, winter just feels like, well, winter now. Cold, icy and gray, with a blue sky and a few clouds every so often. I shouldn't complain - for as many freezing days we have, we get just as many gorgeous sunny days. And yet, it's still winter and I miss wearing flip flops. My hair and skin are so dry and I'm in perpetual need of a pedicure (a manicure, too, for that matter). My nails are sadly neglected! Jamie's feet are actually much nicer than mine since he always wears socks, and I refuse to wear socks around the house, for some reason that I don't even understand, even when my feet are cold. Yesterday, I woke up to snow - not too much at first, just a light dusting. And although Coloradans should be able to handle driving in the snow pretty well, there are still those who drive like complete morons. Hence, the 300 plus accidents reported yesterday morning in Denver. When I started out, I didn't think it would be too bad, but once I was on the highway, I saw the nightmare of sliding, skidding and crashing unfold. It took me 45 minutes to drive just 10 miles, and with 40+ miles of my commute still left, there was no way I could keep going. So, after turning around and spending another hazardous hour driving home, I was safe and warm working from home for the rest of the day. 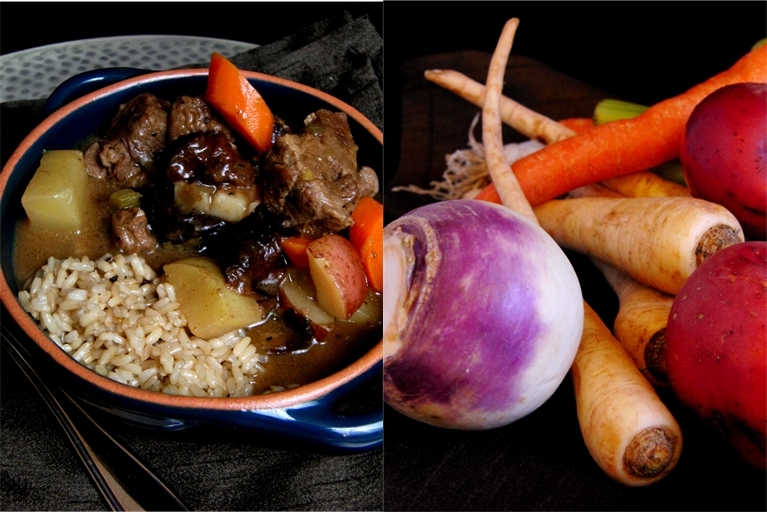 It snowed steadily for most of the day and it just felt like a night to make stew for dinner. Hot, filling, nourishing. Something I could get going with 15 minutes of prep and then just let the dutch oven do the rest of the work while I tucked myself under a blanket on the couch to watch Modern Family. 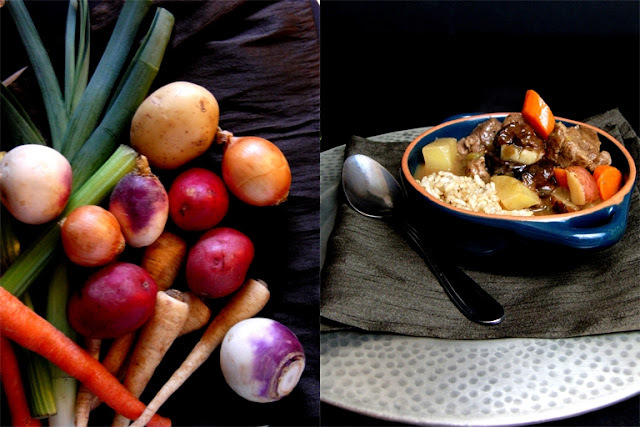 The stew was hearty and flavorful with a mixture of lamb and beef, leeks and garlic, lots of root vegetables like carrots, parsnips, turnips and potatoes, and a handful of dried plums, all seasoned with bay leaves and thyme. It was perfectly delicious for such a cold night. Season the meat with salt and pepper and toss with 2 tablespoons of the flour to lightly coat the meat. In a dutch oven, or a heavy stock pot with a tightly-fitting lid, heat 1 tablespoon of the olive oil over medium heat until it's hot enough that the meat sizzles when you place the meat in the oil. Cook the meat for about 10 minutes, stirring occasionally with a wooden spoon, until mostly browned. Remove the meat from the pan, place in a bowl, cover with foil and set aside. Add the remaining tablespoon of oil to the pan. Add the leek and celery, with a pinch of salt, and cook for 4-5 minutes. Add the garlic and cook for 1 minute. Add the red wine vinegar to de-glaze the pan and scrape up all the browned bits from the bottom with a wooden spoon. Sprinkle the remaining 2 tablespoons of flour into the pan, stir and cook for 1 minute. Add 4 cups of the chicken broth, the parsnips, carrots, potatoes, turnips, plums, bay leaves and thyme. Return the meat to the pot. Add a good pinch of salt and pepper. Bring to a boil, then cover and reduce to medium low to simmer steadily. Simmer until the meat is very tender, about 1 1/2 hours. Add additional chicken broth if the stew is too thick for your liking, and adjust the seasoning to taste.